So, in the summer, life is crazy. Plans are spontaneous and vacations abound. Then the fall comes and I’m like, “Thank GOD! We can finally slow down, get back to a routine and enjoy autumn.” Yeah right. School starts and the season changes and, yes, we do have a routine, but is it really less chaotic than the summer? I don’t think so. I still have an older child to get to school on time, homeschool lesson plans to create, finalize, print off and teach, 4 different lunches to make, dinner to plan and prep, babies to change and get down for naps, and oh yes, A BLOG to write, promote and answer emails for! So, suffice to to say that I am run very ragged right now and I apologize if I am not answering emails or posting amazing motherhood stories as frequently as I had hoped. I’m certain it will get better soon. Of course then the HOLIDAYS will be here. Who am I kidding? I seriously think I have this misconceived notion in my head that life will slow down, but honestly it never does! Oh well, it certainly keeps me on my toes and prevents boredom, though, doesn’t it? All that being said, while I try to keep my head above the water at home and prepare for the AMAZING upcoming “adoption month” stories I have planned for you in November, I’d like to repost some of my favorite oldie, but goody mama stories. I hope you enjoy! You don’t have to have biological or legal children to be a mother. Sometimes, a woman can take on a mothering role in the lives of others as a mentor and teacher. Lana’s story is a beautiful example of this precious and important job. Life can throw us all sorts of curve balls; teen pregnancy, single motherhood, blended families. Motherhood is an adventure and Beth’s story paints an exciting picture of how life can be full of adventure as well if we choose to never let circumstances get us down. There are working mothers, stay-at-home mothers, part-time mothers and to each her own. But sometimes we get to the middle of our lives and wonder if what we did was right. If the sacrifices were worth it. And then we reach a crossroads; where will we go from there? Kara shares her own personal struggles with this in her powerful, ‘coming into her own’ story. Don’t worry, it will eventually slow down – after the kids are grown up and the nest is empty! Enjoy, no CHERISH, the hectic-ness (if that is a word) of this time. Not to say the empty nest isn’t great as well! I know how you feel. I keep thinking if I can just work like crazy and get ahead on the blog and still do the family and house things then I will be set but like you who am I kidding life will not slow down for at least 17 years when my youngest hopefully goes to college and then I am sure I will be busy in a different way. Oh, I am not looking forward to my kids growing up and going to college, I actually am sad thinking about it. Amen! Thank you for resonating with me! In a way, I am thankful for the craziness, because it means my arms are full and not empty. Thanks for stopping by M2M today! Blessings! She told me she was sorry it was a tough day. I could go on. It is hard when life won’t slow down, but I hope I can see the best of it. Amen! Thanks for stopping by and reading! Life is just a long list of things to do! You get up, do your best, sleep and repeat (at least that’s what I keep telling the kids!) I tell myself that only boring people have spare time (and tidy houses), it helps to make me feel better and I dash from one thing to another trying to keep up! I like that, thank you! Blessings to you as you dash this weeks, too! Absolutely! There are always a couple things that can “go.” Thanks for stopping by M2M and reading my post today! This is me exactly! I love summer and will miss the warm weather, but always look forward to things slowing down. This year, my sister is getting married in November so things will be pretty ramped up until then. And then there’s the holidays, etc., etc. I’m also going to check out the link for Lana’s story because, as a stepmother, I don’t always feel I fit in on “Mother’s Day” and other “Mother” themed events. But, I realize I have an impact on her life. I blogged about this around Mother’s Day this year. Thanks for acknowledging this. I LOVE that! You play such an important mother role in your stepdaughter’s life. I would love to read your post about this, and if you are ever interested in sharing that story here, I would be honored to feature you! Thanks for stopping by. It is so nice to know someone understand what it means to e a single mom during hunting season, LOL! Have a blessed week! Let me tell you, I can relate to you 100%. Life doesn’t slow down often enough anymore. It seems like we’re all living a rat race to try to keep up with everything. I can remember having loads of time to read books and chat with my mom while she leisurely enjoyed a cup of coffee. Your post hits home in many ways. In all out honestly, I think we place many of these stresses on ourselves. Of course, I’ve noticed it more since I got a new planners that are literally forcing me to look at how I spend my time more. I can totally relate. For me when this time happens it feels like the walls are closing in on me and I have to stop and take a look at all that I have on my plate and figure out what i need to cut just so that I can get me some me time. Without my me time I’m not the same mom, I’m not the best mother that I can be. So true! I need to take care of me in order to take the best care of my family. Thanks for stopping by M2M today and reading! There is a time when they leave home and you just wish them back to those toddler days, but your days can be just as full and hectic with too much to do but no excuses as to why you haven’t completed them. I’m so glad I stumbled across your blog through Casey’s link up, we are in the middle of an adoption so I always enjoy reading others stories. I’ll be checking out those links! Yay, I am so happy to hear! Thanks for stopping by today! I hear you… fall can be a very busy season. Be gentle on yourself. It’s nice to reshare some oldies too… that way you don’t have to dig up new content, you can bring life to old content! Wishing you some peace and calmness in this season. Wow, you have a full plate. Remember to take a few minutes each day to be still and breathe Him in! Have a blessed week. 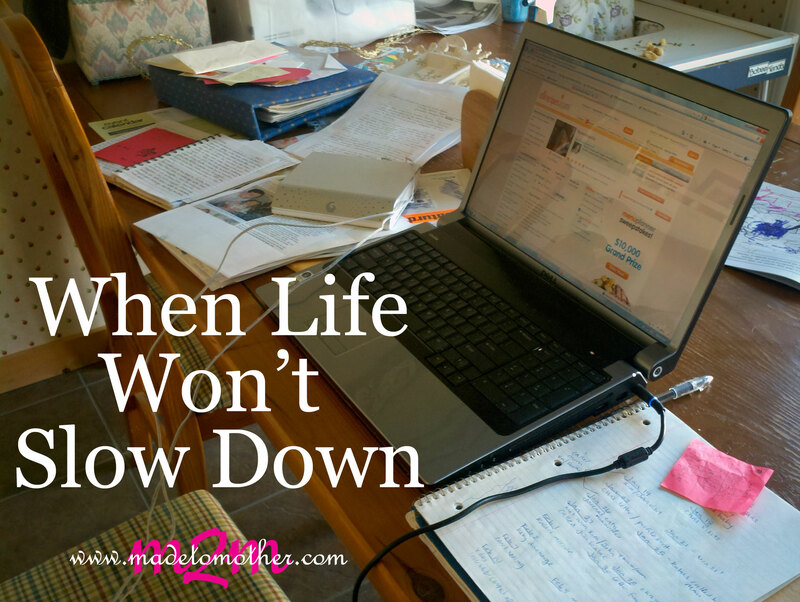 I’m guilty of thinking life will slow down, too. Then I’m disappointed when it doesn’t! 🙂 Hope you have a wonderful fall even though it’s busy! Thanks for linking up to Motivational Monday. I’m still waiting for things to “settle down” and I just became a great-grandma! But I praise God that I’m still able to do all the things I do! While I do believe we all need more “margins” to keep us from running-ragged, it’s good to embrace every season, even with its busyness. Amen! I love the idea of “margins” in our life. Thanks for stopping by today and leaving some comment-love! I know what you mean. I keep thinking if I can get organized enough and streamline my processes enough, then that will be enough. But the truth is, that when I run out of things to do, I find more things to do. I think it’s really a matter of just choosing to STOP. Which is very hard to do sometimes! Thanks for sharing on Equipping Godly Women Fellowship Fridays! That is SO true. Must tell myself to just STOP. Thanks for visiting today! No, I don’t think life ever slows down. Thanks for linking up at the Thoughtful Spot Weekly Blog Hop! We hope you stop by again next week!